With a growing need for a vision-based approach, combination surgeries are gaining rapid momentum as the only treatment option for prospective candidates. With advances in surgical techniques, instruments, and the use of technology such as advanced lasers, patients are feeling more confident than ever that their vision will not only be corrected beyond 20/20, but also irregularities and shortcomings like dry eyes and astigmatism which had made them non-candidates can be addressed while preserving and correcting vision beyond 20/20. Eye surgery is one of the most exciting and rapidly growing specialties as more and more people are requesting highly dedicated surgeons to treat simple to complex and many times, multi-factorial cases. Age is no longer a factor as patients as young as 18 and patients as old as 90 are searching for the best eye surgeon who will allow them to see better than they ever have. Patients with cataracts, for example, have many more options today than nearly a decade ago as cataract surgery has become the most common outpatient surgery performed. While the only option for cataract cases is to replace the cloudy lens with an artificial lens, patients are escaping the traditional treatment of cataract surgery where Vision is Left on the Table and are opting for revolutionary options such as Multifocal lens implants. Unfortunately, there are still many eye surgeons who are treating patients as numbers with the only motive being the amount of cataract surgeries they can perform in a day. Dr. Arun C. Gulani, director of the Gulani Vision Institute located in Jacksonville, FL is revolutionizing the way patients see based upon a custom vision correction approach. While many eye surgeons may be fully comfortable with one or two techniques, Dr. Gulani has a total of 40 techniques and combinations that allow him to identify each specific case and tailor a course of vision corrective surgery accordingly. This ability not only allows him to plan for vision beyond 20/20 but also allows him to correct "Non-Candidates" and make them into candidates and free them of glasses and contact lenses. Additionally, Dr. Gulani can work on cases of previous eye surgery like cataract or Lasik or Radial Keratotomy (RK) and enhance their vision to perfection. Even complications of Lasik surgery can be reset back to normal vision. This ability of combining Vision corrective surgery using all elements of the optical system of the eye allows Dr. Gulani to review and repair every eye like a camera so it can function to its best vision without glasses. 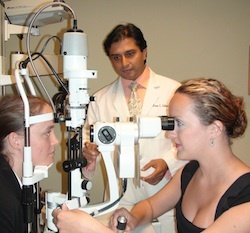 Unlike many eye surgeons, who are satisfied with only improving a patient's ability to see, Dr. Gulani approaches each patient in such a manner that they both strive to surpass the limitations that have been imposed on the patient to result in what he calls "Vision Freedom", the ability to see distance and near without any dependence on glasses. So whether it is giving hope to non candidates or enhancing vision with Lasik on previous cataract surgery eyes, he continues to advance the level of diagnostics, technology and application surgeries to add to the entire menu of customized surgical options that both Dr. Gulani and his patients can confidently select from.